Reenactors from the Boston Tea Party Ships & Museum placed commemorative markers on graves of patriots who participated in the protest. 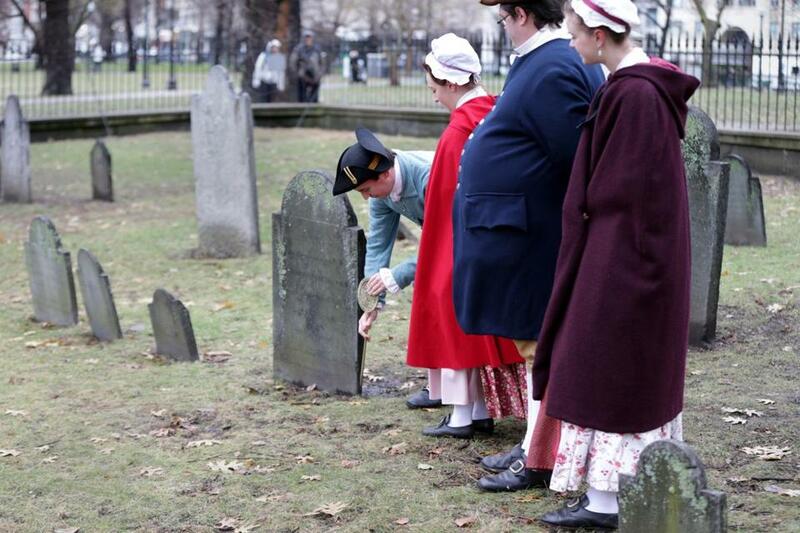 A group of colonial reenactors at the Central Burying Ground endured harsh gusts of wind that swept through Boston Common Tuesday morning as they staked golden commemorative markers into the ground in front of about a dozen gravestones. 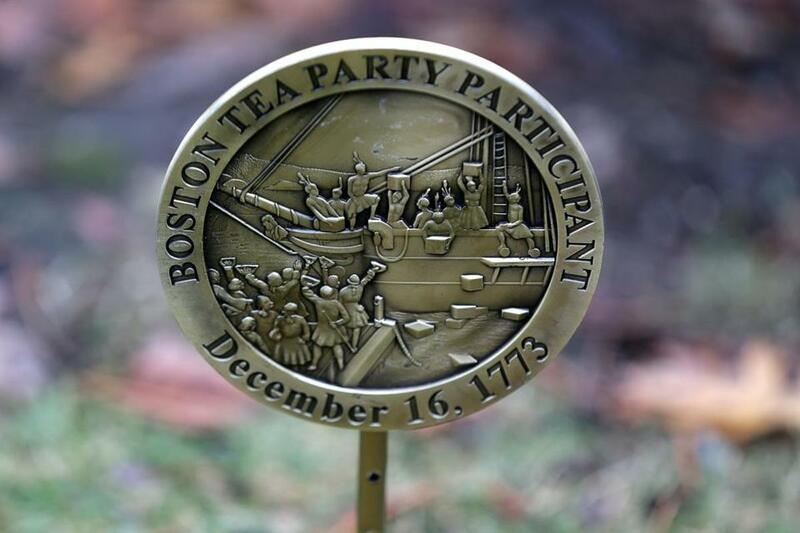 The circular markers, each one featuring a depiction of the Boston Tea Party, mark the final resting places of many of the patriots who participated in the protest in Boston Harbor nearly 245 years ago. The gesture was organized by officials from the Boston Tea Party Ships & Museum, which on Dec. 16 will host a reenactment to celebrate the exact anniversary of the pivotal protest that saw colonial rebels dump more than 300 chests of tea into Boston Harbor, denouncing what they believed were unjustified British taxes, including a tax on tea, according to the Massachusetts Historical Society. Among the Tea Party participants whose gravestones were marked Tuesday were the four Bradlee brothers from Boston — David, Josiah, Nathaniel, and Thomas — and their sister, Sarah Bradlee Fulton, who became known as the mother of the Boston Tea Party after she gathered the Native American-inspired disguises for many of the protest’s participants, O’Brien said. The Central Burying Ground was one of four cemeteries along the Freedom Trail in which Tea Party participants were recognized with the commemorative markers Tuesday. Approximately 55 other markers were placed throughout the King’s Chapel Burying Ground, the Copp’s Hill Burying Ground, and the Granary Burying Ground, including one on Paul Revere’s grave, organizers said. Museum officials are hoping to continue to honor Tea Party participants over the course of the next five years, leading up to the 250th anniversary of the dramatic protest. The plan, O’Brien said, is to put markers on the gravestones of participants throughout the country, not just in Boston, as participants were buried all over the eastern half of the United States, from Maine to Illinois. But at the end of the day, the Boston Tea Party will always be representative of the passion and perseverance of Bostonians like the Bradlee siblings, O’Brien said. One of the commemorative markers at the Central Burying Ground on Boston Common.